Drama. John Maynard Keynes (1883-1946), was an economist and, despite all of that knowledge, a pretty good investor too; he coined the term “animal spirits” and observed that “all sorts of considerations enter into market valuation which are in no way relevant to the prospective yield” – J. Maynard Keynes, The General Theory of Employment, Interest and Money, New York, 1936. Oblivious to that observation, the tony fashion retailer, Abercrombie & Fitch Company, has twice failed to respect the difference between those who buy their clothes, and have no hips or waistline by preference and design, and those who buy their stocks, and have ample hips and waistlines by necessity regardless (Business Insider, May 3, 2013, Abercrombie & Fitch Refuses To Make Clothes For Large Women); and, so, has twice driven their stock price in apparently irrational fits of despondency from $70 in 2008 to $20 a year later to $70 in 2011 to $30 a year later and to $54 today (please see Exhibit 1 below). 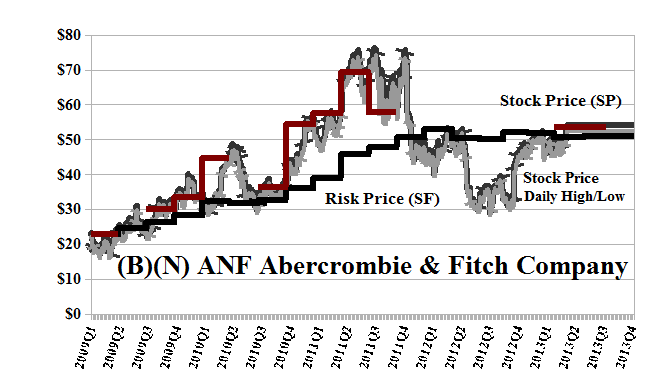 What will they say next (Insight, May 9, 2013, Abercrombie & Fitch CEO Mike Jeffries’s big fat mistake)? We’ve had ample opportunity to own the stock in the Perpetual Bond™ between $30 in 2009 and $70 two years later – respecting our “selling discipline”, else we would have suffered the same fate as many others who were buying or holding it at $60 t0 $70 in 2011 or even $50 early last year – and it’s lunged its way back into the Perpetual Bond™ at the current $54 (please see Exhibit 1 below; Red Line Stock Price (SP) above the Black Line Risk Price (SF), and for no other reason). The company has gross sales of $4.5 billion per year but manages only a paltry dividend of $0.20 per share per quarter, or $63 million to its shareholders for a thin yield of only 1.5%. The indicated quarterly volatility in the stock price is minus ($6.50) per share or ±12% so that any price between the current $54 and $48 to $60 should not surprise us. If we give them another chance at $54, then we’re also going to buy the August “collar” at $52 for $3.50 per share and sell an offsetting short call at $58 for $3.00 so that for $54 for the stock and $0.50 for the collar ($3.50 less $3.00), we can ride out the summer sales at between $52 and $58, in case it’s a warm one and Mr. Jeffries is right after all. And please see our Post, Pension Envy, May 2013, for an update on the snugly fitting Lululemon Athletica’s “material” adventures. Abercrombie & Fitch Company is a specialty retailer, which operates stores and direct-to-consumer operations. The Company sells products, including casual sportswear apparel, including knit and woven shirts, and graphic t-shirts. From the Company: Abercrombie & Fitch Company, through its subsidiaries, operates as a specialty retailer of casual apparel for men, women, and kids. It operates through three segments: U.S. Stores, International Stores, and Direct-to-Consumer. The company sells various products, including casual sportswear apparel comprising knit and woven shirts, graphic T-shirts, fleece, jeans and woven pants, shorts, sweaters, and outerwear; personal care products; and accessories for men, women, and kids under the Abercrombie & Fitch, abercrombie kids, and Hollister brand names. It also offers bras, underwear, personal care products, sleepwear, and at-home products for girls under the Gilly Hicks brand. As of February 2, 2013, the company operated 912 stores in the United States and 139 stores internationally. Abercrombie & Fitch Co. sells its products through its stores and direct-to-consumer sales. The company was founded in 1892 and is headquartered in New Albany, Ohio.